" To my friend Kay Hess ... 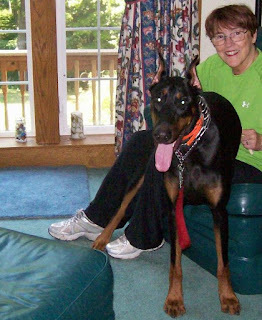 I have loved every one of the dobies Bob and I adopted (one at a time over the years). But THIS dog, our Mick, was so unique. I cannot say enough about him nor accurately describe how much I miss him. Now I love to think of him with Bob, both of them pain-free and romping once again together as they did so many times in life. Bob brought him home to me when he realized his own time would be limited, though neither of us (or Mick) would know how long. My friend Connie Naumann Luhta calls Mick 'The Entertainer', because our Mick did anything he could to make us laugh. Laughter really IS the best medicine, and when it combines with all the other qualities of the creature we have called 'the dog,'what could be better to enrich your life? Walking with two congenial, loving presences--Bob and Mick--who laughed a lot and savored life and those around him... What could have been better? I still happily walk with the memories." --Rose Moore, from a facebook posting yesterday, in answer to a friend who had detected that I was lonesome without Mick; and would I get another dog? I guess her question wasn't really answered; I have not yet answered it in my own mind and heart.